My ultra creative friend, @automobilistmom , introduced me to this high-tech maker-space. It was originally an outreach project of MIT 's Center for Bits and Atoms (CBA) and now is a global collaborative network of people who like to create. A local FabLab chapter describes itself as "a high-tech, self-discovery facility for inventors, entrepreneurs, tinkers and anyone looking to design, prototype and create. If you can envision an idea, you have access to a variety of technologies which allow you to produce a prototype through the use of computer-aided design and desktop manufacturing technologies. It truly is possible to "make almost anything" and turn ideas into reality in our FabLab." Being someone who constantly has ideas simmering, this hands-on, make-my-idea-reality space was like a dream come true. The workshop on Batik print making was especially appealing as I have longed to know more about the art of block printing for many, many years. 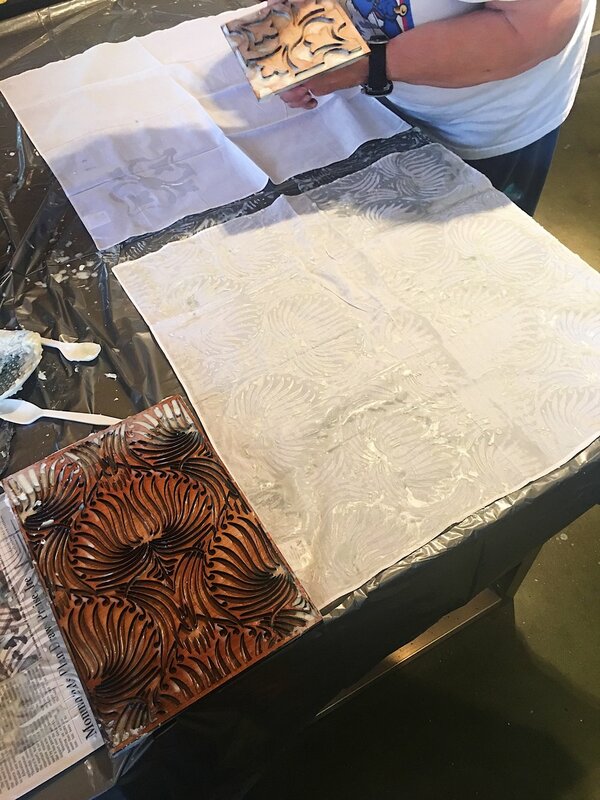 While my deepest interest is in the stamping method employed in India, learning about the Indonesian art of Batik, which uses wax rather than dye to create the pattern, had many merits. One of the biggest being that I could create my own stamp. This is where FabLab was useful. Their laser technology would be put to use to carve my design into a wooden block. The first step in the process was to find a design. Since this class was just for exploration of the technique we did not feel confined to creating traditional Indonesian-designs. Nor did we use typical Batik blocks created with copper. We used wood as our base for the stamp. The eight participants in this class each had a particular design style based on their personal interests. Two women interested in the Hawaiian culture chose palm leaf and wave designs. The quilters created stamps that reflected their knowledge of quilt forms. A mother-son duo from Ukraine employed a design that looked to me like an embellished medieval knight's sword. @mobilistamom, being a student of fashion design, created her own original piece with mid-century modern overtones. Since I adore the world of interior design, my shape came from the pattern I found on an admired wallpaper. 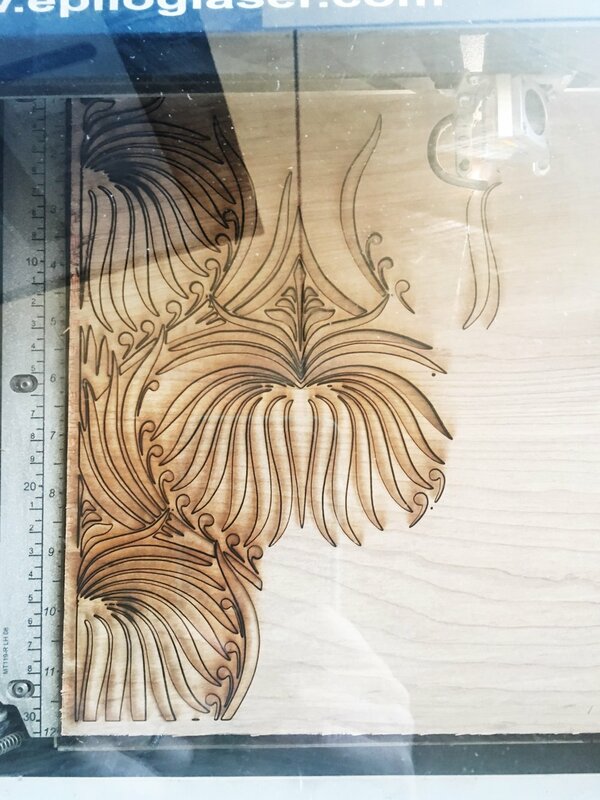 It was so fascinating watching the laser cut my wooden block, precisely creating the intricate curves of the lotus in the design. I have put a video of the laser here. Once the form was created we glued it to a wooden backing. When the glue had set, we began the wax-stamping process. It took several attempts to get the feel for stamping. I dripped wax everywhere. It was messy and I made a million mistakes. The process was very tactile. Smelling the hot wax, feeling the pressure of the stamp on the fabric, peeling the stamp up to glimpse the impression-- it all was just so cool! Once the stamping was complete, the fabrics were bathed in a dye and left to set. Finally we washed the fabrics in lukewarm water to remove excess dye and then scrubbed the wax like we were ancient washers at the bathes. It really takes some muscle to remove the wax. The traditional way to remove it is more time consuming but less muscle-straining. 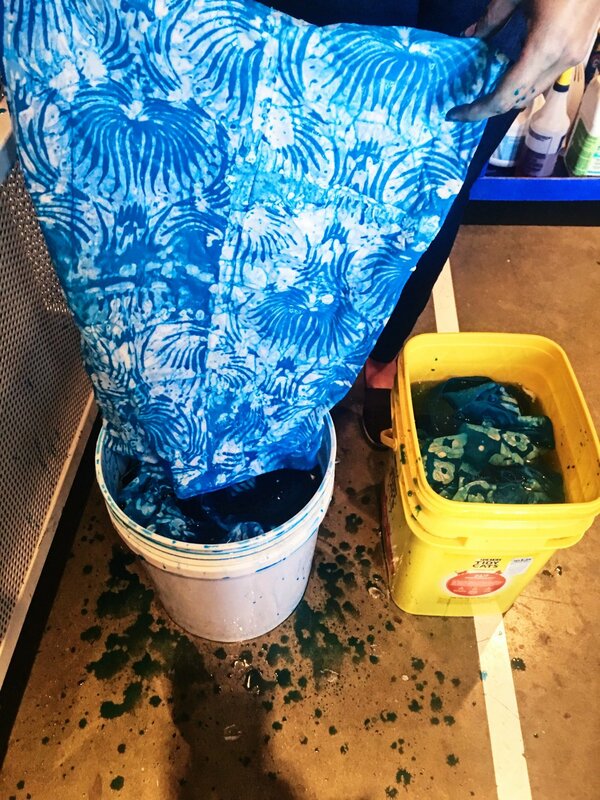 The batik-printers boil the dyed fabrics, melting the wax and skimming the waxing liquid off the surface. The total process of creating, dyeing and washing took around 6 hours (minus an hour for lunch). My design was absolutely not perfect since my wax drippings spotted the fabric, and my stamping was uneven. Yet, I learned! I created! And I loved the process. Now I understand better an art form that I have long been interested in and I have knew knowledge to help me create my own designs in the future. If you have the urge to create just about anything check out a FabLab in your neighborhood. We would love to hear about your creations and what you learn!